After a 10 year hiatus I am back with new material. Based in Los Angeles CA, I write, record, and produce my own music. From Classical to Rock to Punk, the music you need to hear for whatever mood you are in. gramps.doc is sort of an experiment in the new way the music business is. People now have the capability to get individual songs more easily, so that opens me up to compose more different styles of music. As you can see if you listen there are many styles of music, so please listen to it all, I am sure there is something there you will like. Enjoy! What does the name gramps.doc mean, where did it come from? Well, it is the two nicknames I have had kinda put together. Other people I was in bands with gave me that nickname because I "got things done" and took care of most of the band business. When I was in the Air Force I initialed the shift change sheet dr and they started calling me doc. So with everything now dot this and dot that, I decided on gramps.doc. Around the turn of the century I had my second child and my family needed me and I was done with band life so I hung up playing guitar. After a few years I got the itch to learn the piano and also broaden my composing to include Classical music so I got a digital piano and slowly began my present endevor. As my children neared the teen years and needed me a little less I had the time and the drive to finish the 14 songs on my Helium Light Bands CD. 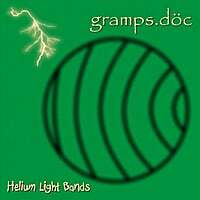 "Helium Light Bands" Reviewed by RadioIndy.com! Classical to Rock to Punk - The music you need for whatever mood you are in.